Once in a lifetime. That’s how Kellye’s dad, Lowry, described the experience of walking his daughter down the aisle. As he stood on the pier next to his lake home, surrounded by friends and family, Lowry gave a toast to the newly married couple celebrating their lives together. As the scent of the hydrangeas mixed with the delicious smells of the down-home cooking from Sissy’s Southern Kitchen, we were mesmerized by this family’s appreciation of each other, their cowboy humor, and the beauty of the night. Enjoy this preview of their wedding film. Don't you just love the confetti guns they gave their guests to use during the ceremony kiss? It looked so gorgeous in the early evening light! Click here to see the perfect rustic wedding photos that Genya from Vue Photography took at the event. When we arrived at the lakefront house, the band members from ATX band The Good Nights were tuning their instruments and practicing sweet tunes like ‘Landslide’ on acoustic guitars. The sunlight bounced brightly off of the lake, and as we peeked around at what Tara Wilson’s team had set up, we were met with visions of hanging lights and garlands of magnolia leaves. 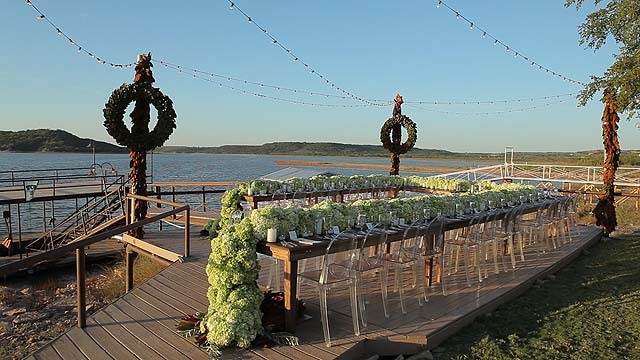 The dining table was stationed on the waterfront deck with a solid row of hydrangea arrangements that cascaded onto the floor at each end as if it were a luxurious curtain made of flowers. The team had also brought the indoors outdoors by setting up a faux living room arrangement next to the dance floor. The antique furniture in white and burlap provided a fun place in the party area for guests to lounge and chat during both cocktail hour and into the late hours of the night when not dancing the night away. Inside the house, family members (and several doggie friends) bustled about, and Kellye, the bride, was peering out the window watching "Vaa," the officiant, practice outside in the backyard. When we noticed that Kellye had air plants mixed into her bouquet of succulents, she told us that when she was dreaming up her ideal bridal bouquet, she told the designers at Branching Out Events that she was flexible with her vision and fun, and so to please "put something wacky in it." We love it, too! Kellye told us how she and Dustin met. She said, “Dustin and I have known each other since I was 3 and he was 6, we actually were next door neighbors. It seems crazy to think back then we would have been together. We started officially dating when I was a senior in high school in 2007, we have been together now nearly 7 years." Kellye & Dustin have such a precious story of how their lives have been interwoven through childhood, and it was such a joy to film their family celebrating all the good things that are to come in the future.